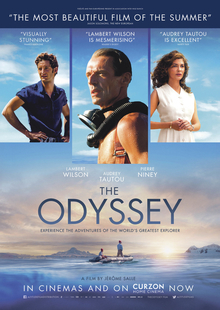 The Odyssey (French title: L'odyssée) is a 2016 French-Belgian biographical adventure film directed by Jérôme Salle and written by Salle and Laurent Turner, based on the non-fiction book Capitaine de La Calypso by Albert Falco and Yves Paccalet. The film stars Lambert Wilson, Pierre Niney, and Audrey Tautou. The film follows Jacques-Yves Cousteau, the great French ocean-going adventurer, biologist, and filmmaker. Principal photography on the film began on 7 September 2015 in Croatia, where filming took place on islands Hvar, Vis, and Biševo. Shooting was also done in South Africa, Antarctic, and The Bahamas, and it ended on 8 January 2016. Lead actors Pierre Niney and Lambert Wilson at a premiere in October 2016. In France, the film was released on 12 October 2016 by Wild Bunch. ^ a b c d "Biopic about legendary Jacques Cousteau, The Odyssey, filming in Croatia / News / Filming in Croatia". filmingincroatia.hr. 14 September 2015. Retrieved 10 January 2016. ^ a b c Lemercier, Fabien (17 December 2015). "Cineuropa - the best of european cinema". www.cineuropa.org. Retrieved 10 January 2016. ^ "French Film About Life of Jacques Cousteau Filming on Croatian Islands". Croatia Week. 13 September 2015. Retrieved 10 January 2016. ^ "On the Set for 1/8/16: Robert Pattinson Starts on the Feature, 'Good Time' While Michael Fassbender & Marion Cotillard Wrap 'Assassin's Creed'". SSN Insider. 8 January 2016. Archived from the original on 9 January 2016. Retrieved 10 January 2016. This page was last edited on 17 December 2018, at 19:31 (UTC).